There is no marking on the left hand vase but the middle and right hand vases do have four symbols each. The tallest vase is no more than 7 inches in height. Thanks so much for your help in establishing authenticity and date. To me it looks as if the ring mark has only one single ring. It should be a double ring. Is it only my computer that makes it look that way? Single ring marks are extremely rare, and possibly did exist only in the Ming dynasty. The calligraphic writing is also a bit off the quality I see on BW Guangxu export items. The other thing that I find peculiar is that the marks look as if they were darker than the blue decoration. This all makes it look as if the marks were added later. Maybe it would be better to check if the blue of the marks is underneath the glaze? Otherwise, I agree with you that they look like Guangxu items. All three items look like they were made around the late Guangxu to early Republican period. This is more true for the two pieces bearing the four character Kangxi mark. Quite a few porcelain pieces with this mark were made at that time during the turn of the century as there were plenty of foreigners in China hunting for antiques. 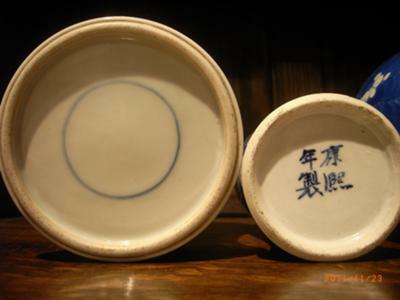 As a result, the potters were only too happy to sell them these "antiques" from the Kangxi period. Aside from the pieces with the four character Kangxi mark with or without the double circles, wares bearing the apocryphal mark of Yongzheng or Qianlong also were made. 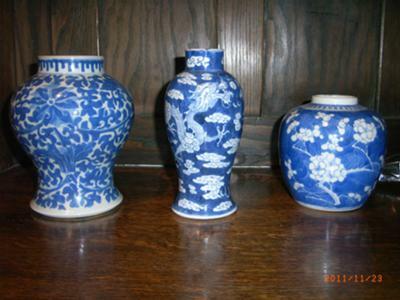 You live in London, Mike, and there's no better place to learn about antique Chinese porcelain than at the many lectures, previews, and auctions that take place there every summer. The pictures are insufficient to say anything further. Detailed pictures with some closeups of each item would be needed. The ginger jar on the right side should be no problem. With the other two, detailed pictures are needed. Basically, the marks of both pose a problem. 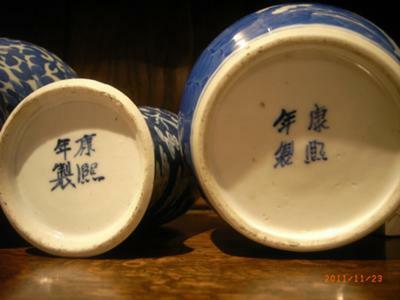 The characters of the higher vase looks as if someone not knowing Chinese did copy these chracters And, the ring on the other also looks a bit suspicious. But, the image is too small to see clearly.